A New York City real estate technology company was filming b-roll at a Brooklyn park when a feature-worthy event got in the shot. 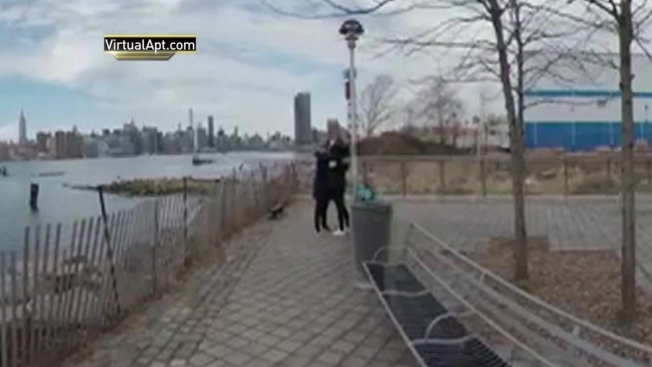 VirtualApt said its 360-degree video-shooting robot was stationed in Bushwick Inlet Park in Williamsburg on Monday afternoon when it accidentally filmed a man getting down on one knee in an apparent proposal. The company said it didn't know the camera had caught the touching moment until afterward and is now trying to find the couple so they can have the footage. "We saw the proposal and thought it would be nice to share it with the couple so they could have that moment forever on video," a company representative said. The footage shows the pair sitting on a bench at the East River waterfront, looking curiously in the unattended robot’s direction in the otherwise unoccupied portion of the park. 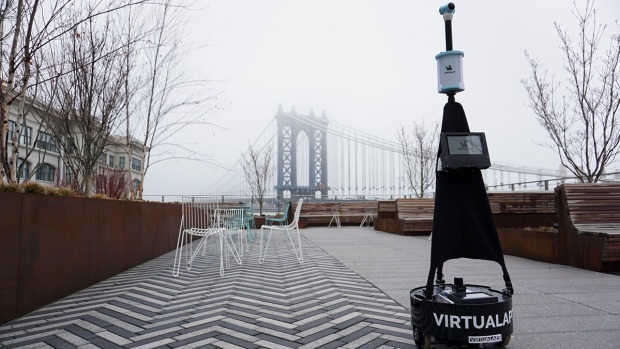 VirtualApt's 360-degree camera sits near the Manhattan bridge. They both then stand up and embrace for a few seconds before the man reaches into his pocket -- presumably for a ring -- and gets down on one knee. It wasn’t clear what the man said to the woman, or if she replied with a “yes” because whipping winds drowned out other sounds on the robot’s microphones. But the woman can be seen putting her hands over her mouth in surprise before leaning down to kiss the man. They then stand there for a few more seconds before the video ends. The company said the robot's operator, who had left the area to avoid getting in the camera's shot, didn't realize he had captured the apparent proposal until he started going through the footage on Tuesday morning. That is when the company said it posted the footage on its website, VirtualApt.com, and several social media networks in hopes of finding the couple. If you recognize the couple, email VirtualApt at info@virtualapt.com.